The Xuron 8500 BioShear Flush Cutter features a bent handle designed to fit more comfortably in a user’s hand. 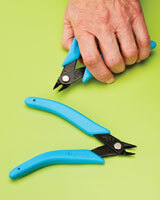 The cutter comes in left- and right-hand versions and is covered with non-slip, soft Xuro-Rubber grips. Ideal for arthritis sufferers and senior workers, the cutter helps keep the user’s knuckles in a straighter line to maintain optimum comfort.